I remember the first time a dog of mine ran off. I was a kid, maybe 14 or so. The family dog was really less a “family” pet and more like “Ash’s dog who tolerates everyone else”. That’s what you get when you tell the dog-obsessed teen that it’s their job to take care of the dog! That dog and I went everywhere together. He routinely tried to get on the school bus with me in the mornings, and he’d always be waiting for me after school. So when I came home one day in midwinter and he wasn’t there, I didn’t even have to ask my parents what happened – I knew he must be lost. That was back a few (ahem) years ago, before microchips for dogs was really a priority for vets or dog owners. We eventually did find my friend, stuck in a fence he’d tried to call through to get at a rabbit. But I’ll never forget the fear I felt thinking that if he went far enough, lost his collar, and got picked up by a new family, they’d never know that he belonged with me. As an adult, when I learned about microchips, I vowed I’d never have a pet without one again. But you’d be surprised how many people don’t microchip their pets. I think that part of the reason is that people don’t really understand a lot of the facts about microchips. I’ve mentioned them a few times before (“19 Tips for Helping Your Dog Survive a Move” and “Your Complete Guide to Winter Care for Dogs”) but I’ve never gone into the facts about these devices. So here’s what I know, and hopefully it will help someone else out there hang on to their beloved pet when the worst happens. Microchips are specially designed medical devices. They are made to go inside the body, and have been thoroughly tested to ensure safety. There is a myth in some circles that microchips might cause canine cancers. This is completely untrue. There is no proof that any microchips have ever caused cancer in a dog. In fact, studies have shown that out of the hundreds of thousands of dogs that are microchipped every year, about eight will have bad reactions. The biggest worry is infection, which can be a risk with anything you may insert into a body. 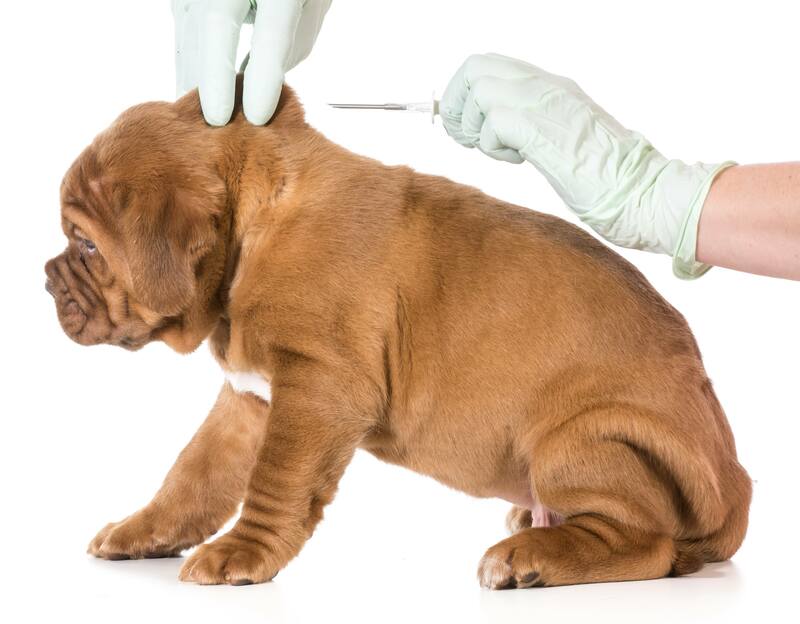 Infections are easily managed with medications and an experienced veterinarian will keep a close eye on an injection for any signs of infection. The microchip doesn’t actually beam your home information into the scanner device. Instead, it tells the scanner device an ID number. The vet or shelter worker then has to look up that ID number in a database. The only way that they’ll be able to find you from that number is if you keep that database updated. This means every time you move, change phone numbers, have your name changed, anything like that – you need to log in and update that database. If you don’t know how to do this online because your dog came microchipped, go to your vet and ask for their help. There’s one very important reason for this system – so that no one is able to just grab your information from your dog. Only someone who can access the chip databases – such as a vet or a kennel, with their industry ID and passwords – can get to your address and phone number. In the past, it was up to a judge to decide between two people who each claimed ownership of a dog. Let’s say a stray shows up in your neighborhood, and you start taking care of it. You feed it, take it to the vet, put up flyers, and months pass. No one claims the dog, and you’ve UN officially adopted him. He has a collar with your name, a bed in your house, and your kids love him. You’ve shelled out hundreds of dollars in vet bills and food by now. And six months later, a person shows up at your door claiming the dog is theirs. What do you do? Now imagine you’re on the other side of that story. Your precious dog has been missing for months, and when you finally find him, the person who took him in doesn’t want to give him up. You’d have to hope that a judge rules in your favor. A microchip can help establish that you really are the dog’s owner. And in fact, not checking the dog for a chip when it was brought to the vet could reflect badly on the new owner and the vet they went to. In cases like these, you both know where the legal ownership of the dog lies. Some microchip databases allow you to add a note about any health needs your dog has. If your dog is found wandering, and a vet is able to scan and see that they have epilepsy or diabetes, for example, they could provide better care. Some microchips are being used to keep people’s homes safer. Products like the SureFlap Microchip Pet Door allow just your pet to come inside, and keep pests or other neighborhood animals out. already have automatic pet feeders that allow you to control when your pet gets food throughout the day to prevent overeating. But if microchip feeders hit the market, we’ll be able to ensure that each pet gets their specific needs met with the same feeder. comfortable letting that person take them to a vet or care for them. So having your dog’s name on display is a great way to ensure that someone will be able to catch him and keep him safe. If you’re worried about a name tag that falls off the collar, try a slide-on tag, or get a collar with the name engraved or printed on the side so it can’t be removed. Microchips don’t degenerate over time. They are made with a synthetic material that is considered biocompatible – meaning it won’t harm the dog, but it also won’t naturally wear down because it’s not an organic product. They don’t have moving parts or require power or anything like that, so there’s nothing to really “wear out”. If you are concerned that your pet’s old chip may not be working anymore, ask your vet to scan them at a checkup. One thing that some pet owners worry about is migrating chips. It is true that some chips have been known to migrate around the body a bit – such as moving from the hip to the back. There are a couple of reasons not to worry about this. First, a vet will scan all over the dog’s body to ensure there’s no chip, and the radio frequency emitted by the chip will typically be picked up by the scanner even if they aren’t right over each other. Second, most modern chips are equipped with an anti-migration feature that keeps them in place. When microchips were first released, there was a concern that they wouldn’t be all that useful, because every manufacturer had their own database. If the kennel or vet had a scanner made by a different manufacturer, it might not pick up the chip from a different manufacturer, and then they might not be able to access the database the chip was linked to. But these days, microchip databases and scanners are almost entirely universal. Forward-and-backward reading scanners are the latest technology that are able to scan just about any microchip in existence. A quality vet and kennel will have one of these scanners, and that will also give them access to all the databases the chip could possibly be connected to. Did you know that in Ireland and the U.K., microchipping your pets has been required since April 2016? This has meant a drastic reduction in lost and stray dogs, as well as in accidental euthanasia of a pet. It has also meant a huge decrease in the money that is required from tax payers to keep up shelters and care for strays. By getting lost dogs back with their owners sooner, everyone wins. It has also meant a bit of a reduction in the presence of puppy mills, because it means that breeders who pump out unhealthy dogs can actually be tracked down. This is one of the biggest myths surrounding pet care, and I don’t really understand it at all. Maybe when microchipping got its start it was pricey; or maybe the fact that it’s still an option here in the States, rather than being mandatory, makes it hard for owners to justify the cost. But the truth is that microchips aren’t pricey at all. In fact, if you adopt a dog from a shelter, most of the time the cost of the microchip is included in the adoption fee. This procedure is cheaper than spaying or neutering your pet, and can be done in just a quick visit to the vet. There’s really no reason to avoid the procedure at all. The next time I had a dog get loose was when I first brought Gloria home. My very first Boxer, and the dog that gave me a run for my money when it came to what I knew about training dogs, she was a strong-willed lady. I had just gotten her microchipped a few weeks before, and when she got loose, I was much more calm than I had been as a kid. I knew that if she was picked up, a vet or a kennel would be able to find me. As it turned out, I found her first – romping around with some other dogs a few streets away. But it was a relief to know that I had a tool that could be used to reach me should she lose her collar during her run around. It reinforced my belief that that peace of mind is totally worth the money and the task of updating the database. If you want to know more about microchips, I would highly suggest you talk to your vet or an employee at a kennel. You can find out everything you want to know, and they’ll be able to tell you just how valuable these tools are. Microchipping can be done when the dog is old enough for vaccinations, so ask your vet about arranging that service during your standard puppy checkup. You’ll feel safer and so will your dog! Are Small Dogs More Prone to Joint Disorders?